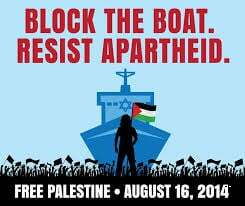 “Block the Boat for Gaza”: Demonstrators Prevent Unloading and Loading of an Israeli Ship at the Port of Oakland, U.S.
For the second day in a row, demonstrators succeeded on Sunday in preventing the unloading and loading of the Israeli ship Zim Piraeus at the Port of Oakland. The ship had delayed its arrival in Oakland to avoid Saturday’s massive demonstration and planned community picket line. Today at around 5 p.m. an emergency blast went out over the Block the Boat for Gaza text network, summoning all hands back to the Port to set up picket lines in front of the gates to the berth where the ship was to dock. Hundreds of people scrambled out to the isolated harborfront site and quickly mounted picket lines at, apparently, all four gates (I could only see two of them). Though the numbers were far smaller than on Saturday, the action succeeded again because most of the longshore workers who had been called in to work the ship (members of Local 10 of International Longshore and Warehouse Union) opted not to cross the picket lines. (None crossed at my gate.) At around 8 p.m. Lara Kiswani, Executive Director of the Arab Resource and Organizing Center (AROC) and key leader of the Block the Boat campaign, picked up a bullhorn and announced that the organizers had just received official confirmation that the shift had been cancelled and the ship would not be worked tonight. Original report (with some edits and new photos added) on Saturday’s action:Thousands of demonstrators demanding an end to the siege of Gaza and justice for all Palestinians succeeded – if only temporarily – in preventing an Israeli-owned freighter from docking at the Port of Oakland yesterday. A diverse and spirited crowd of between 2,000 and 3,000 took part in the “Block the Boat for Gaza” action. The plan was to set up a community picket line outside the freight terminal where the Israeli ship, the Zim Piraeus, was due to dock, in the expectation that longshore workers would honor the line and stay off the job so the ship wouldn’t be unloaded or loaded. The action was originally scheduled for 5 a.m. Saturday, just before the ship was due in port, but on Friday evening, when it became clear that it was circling outside San Francisco Bay instead of proceeding to its scheduled docking, protest organizers postponed the demonstration until 3 p.m. In the afternoon, with the ship still stalling at sea in an obvious attempt to wait out the protest, organizers decided to proceed with march to the port and declare a victory, even though the ship is now expected to dock in Oakland sometime Sunday evening. The action was sponsored by a long list of organizations, but two local Arab-American organizations – the Arab Resource and Organizing Center and the Arab Youth Organization – played central roles in organizing it. The crowd mirrored the enormous (and ever-increasing) diversity and militant traditions of the Bay Area and especially of Oakland. Predictably, most local media ignored the action, though it was among the largest protests in the Bay Area in several years. One TV station that did cover it reported that “At one point the group looked to be well over 100 people” – an assessment that could only have been a deliberate attempt to downplay the demonstration. The Guardian, however, posted a very good report.